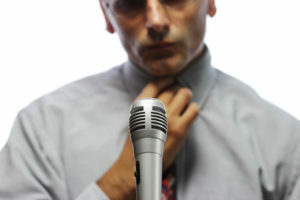 WHY Do People Fear Public Speaking? Why Not is a reasonable answer. Home | Speaking/Presenting | WHY Do People Fear Public Speaking? Is my usual first response. Many are through phones where we don’t see the other person. Increasingly, discussions are conducted by text and email where we don’t see or hear the other individual. It’s easy to understand that standing in front of people and giving a speech takes many out of their comfort zones. That’s why it’s Uncomfortable. Good! Getting out of our comfort zones makes them larger! There are other reasons we Fear Public Speaking. If you don’t know your topic well, really well! You will make a fool of yourself and will fear speaking for a long, long time. If you don’t know the structure of a presentation. You can learn that structure and it is similar to the recipe for a great cake. At specific times, specific ingredients are added then specific things are done with them. The result is a – Great Presentation! You have experiences and knowledge others will love to hear and benefit from. When did you face adversity, rejection, or failure and how did you handle it? What will you do different next time something similar occurs? You are there because you deserve to be in that place at that time. You have a great deal to offer. For most of us it is normal to Fear Public Speaking. Set a goal to conquer that fear and discover how powerful it is to present with – NO SWEAT! Your Elevator Speech - Sixth Floor! More: WHY they hire you. WHY your expertise. Thanks for your kind words, confirming my research, and taking time to post your comment. I know your next presentation will be – NO SWEAT!